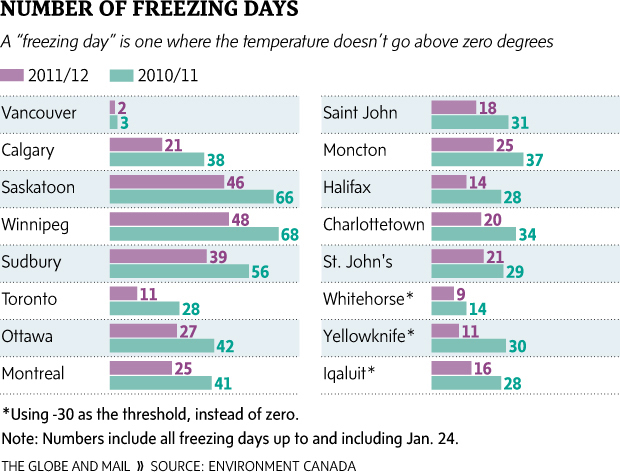 The cycles of freezing and thawing which began in December, continued in Greater Moncton during the first month of 2012. The up and down temperatures led to 13 days with at or above freezing daytime highs but also ten frigid overnights dropping to -15 C or lower, bottoming out at -20.1 C.
Overall precipitation was below normal for January, with slightly less rain and half as much snow, based on the 30-year average. 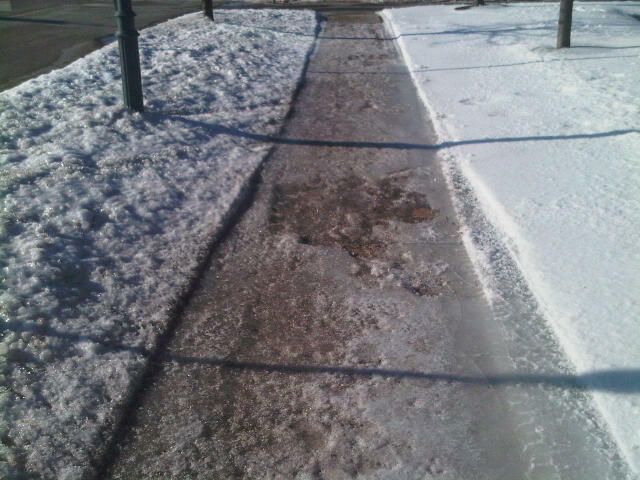 As most of us realize by now, the winter of 2010-11 was far more brutal than the current winter of 2011-12. As above graphic shows, most major cities across Canada have had fewer freezing days (below 0 C) and the same holds true for extreme cold for cities in the far north (below -30 C). Scientists say a positive Arctic oscillation is behind the above normal conditions since it allows polar air to stay north making for fewer cold outbreaks in the south. 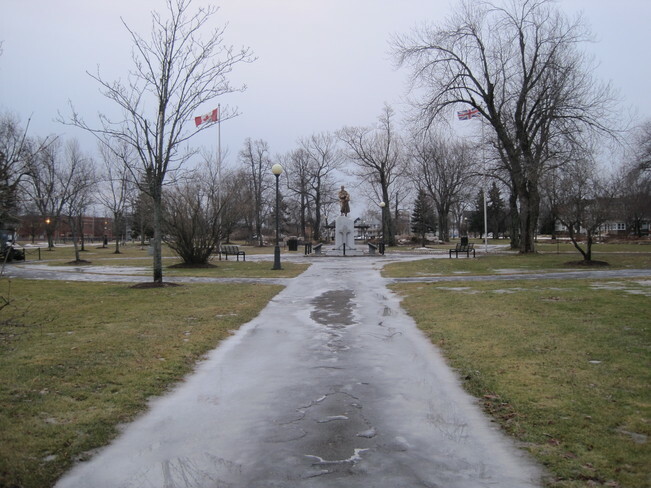 A storm with a mixed bag of precipitation brought a lot of freezing rain to New Brunswick with 8 hours recorded in Greater Moncton and between 9 and 10 hours in Gagetown. In Greater Moncton, total accumulations were 9 cm of snow and 24 mm of rain while Northern New Brunswick received much more snow with 30 cm reported. The above radar image from Environment Canada shows the band of pink (freezing rain, ice pellets) with snow to the north and rain to the south during the height of the storm. 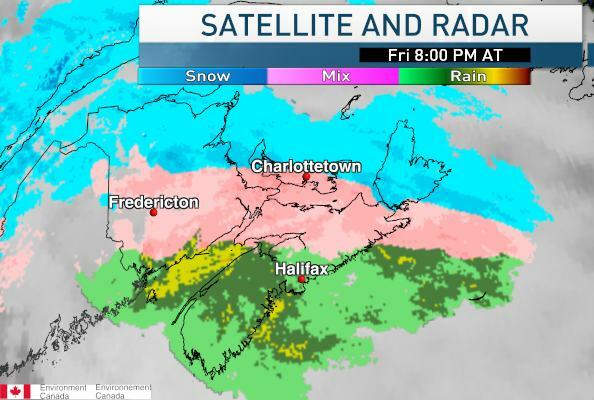 A nasty storm system is headed for New Brunswick from the U.S. Northeast and is expected to bring a mixed bag of precipitation. Snow is expected to begin in Greater Moncton by midday tomorrow with Environment Canada forecasting 10 cm before the snow changes to freezing rain and then rain by evening as the temperature climbs above freezing. Driving conditions will likely be treacherous during the changeover period. A coating of freezing rain quickly followed by rain made for icy road conditions this morning across Southern New Brunswick. As a result, many school districts either cancelled classes for the day or announced that buses would be one or two hours late. The slippery roads are being blamed in a fatal collision early today on Nova Scotia’s Cobequid Pass involving two transport trucks. By midday, temperatures had climbed to as high as 10.7 C in Greater Moncton and some communities came close to breaking records. Although much less snow has fallen in Southeast New Brunswick this winter compared to last, the region has still had its fair share of cold and numerous flash-freeze periods. Arctic air gripped the region over the weekend and yesterday the early morning low fell to -20.1 C at the Greater Moncton Airport – the coldest so far this season. But temperatures elsewhere were even colder, dropping to -33.4 C at Edmundston, -30.3 C at St. Leonard and even -25.5 C at the Saint John Airport. The cold will not last with rain and milder air on the way by Tuesday. Finally, snow in the U.S. Northeast! Much of the American Northeast has seen little or no snow accumulation since a historic snowstorm in late October. 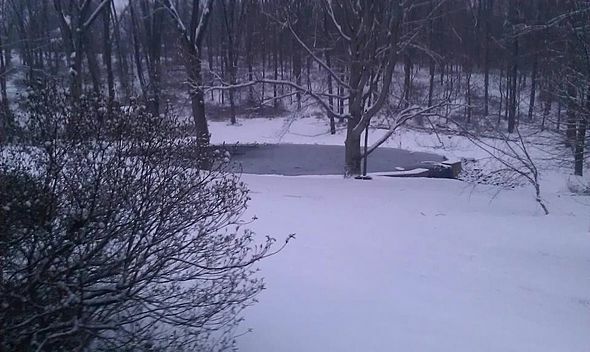 But that finally changed this weekend when a system dropped snow from the Midwest to the Northeast. Snowfall totals ranged from 3 cm in the Baltimore area, 11 cm in New York’s Central Park to more than 30 cm in south coastal Massachusetts. However the snow will not stick around for long with rain on the way for much of the region. British Columbia’s Fraser Valley is getting hit with snow and lots of it – more than 20 cm at last count in Abbotsford. Nearby Vancouver, Victoria and the Gulf Islands have gotten off easy this time with just a centimetre or two. In a region normally accustomed to rain, the storm system is also dumping lots of snow over America’s Pacific Northwest with at least 30 cm (12 inches) expected for Seattle, Washington and 10-15 cm (6 inches) could fall in Portland, Oregon. 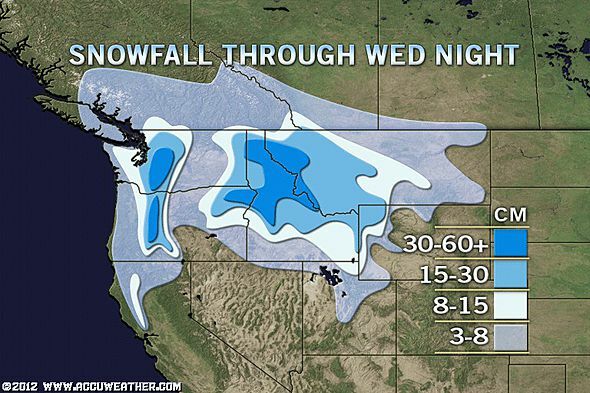 This is the most snow these cities have seen in at least 15 years. Southeastern New Brunswick is digging out from the first major snowstorm of the new year. 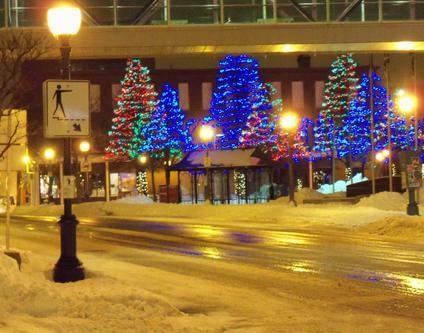 As of early this morning, the Greater Moncton Airport had recorded about 18 cm of snow and freezing rain. Environment Canada says milder temperatures are on the way with about 5 mm of rain in store for the region today. 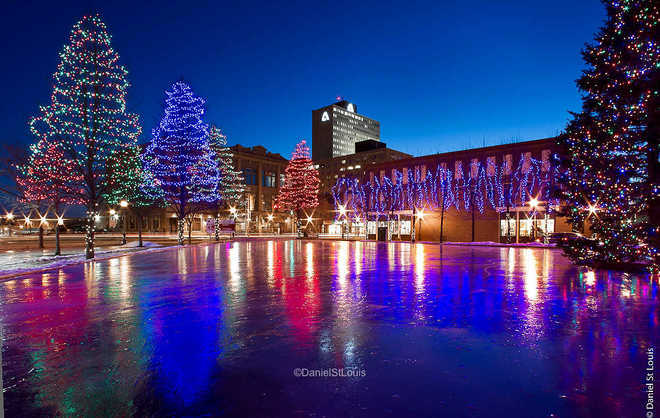 Temperatures will become rapidly colder again tomorrow with frigid-like conditions (near -20 C) expected by Sunday. 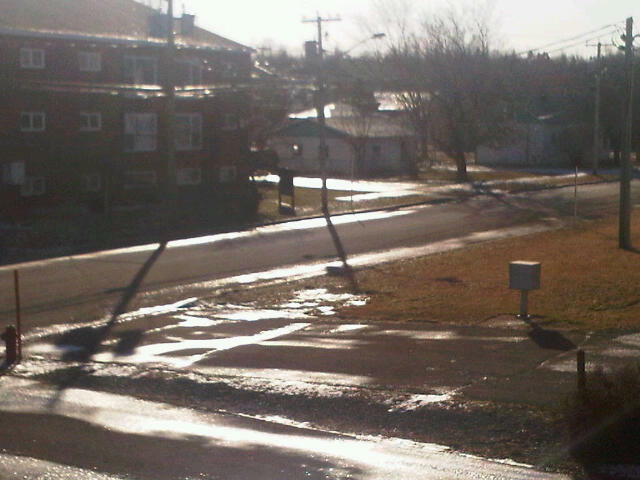 Is winter finally coming to SE New Brunswick? We’ve had cold but have seen little snow in Southeast New Brunswick so far this winter – less than 60 cm in Greater Moncton since late October, compared to an average of about 120 cm by mid-January – but according to Environment Canada that is about to change. Fredericton and Southern York County, Fundy National Park, Queens County, Grand Manan and Coastal Charlotte County, Kent County, Kouchibouguac National Park, Moncton and Southeast New Brunswick, Sunbury County, Saint John and County, St. Stephen and Northern Charlotte County and Kings County. Snow is expected late in the day Thursday and continue overnight. A low pressure system will develop south of Cape Cod early Thursday morning and track northeastward towards the Maritimes during the day and bring snow to most regions by evening. Snow will begin Thursday afternoon in the southwest and spread across the province in the evening. Southwestern regions are currently forecast to receive up to 10 cm by midnight. The snow will continue to accumulate past midnight before it either ends or changes to rain depending on the region. Another 5 cm is possible overnight for some of these regions.